Designed for both pro and home studio use but also applicable to outside broadcast vehicles and post editing suites, TC Electronic monitor controllers offer control over one or multiple reference monitors to ensure the output is optimum for the direct environment. 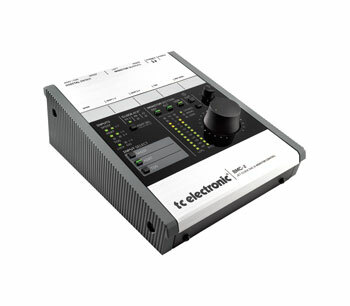 The BMC-2 digital to analogue converter and monitor controller is for use in studios where multiple digital signals need to be routed to a single pair of reference monitors. This self-contained desktop unit can drive up to three listening systems, with balanced left/right analogue outputs to connect to active monitors or the amplifier for passive monitors, SPDIF/AES3-id digital output to connect to active monitors with digital input and a 6.35mm jack socket for headphones. All three of these output options utilise the calibrated listening functionality. All input and output connectors are situated on the rear panel of the BMC-2. 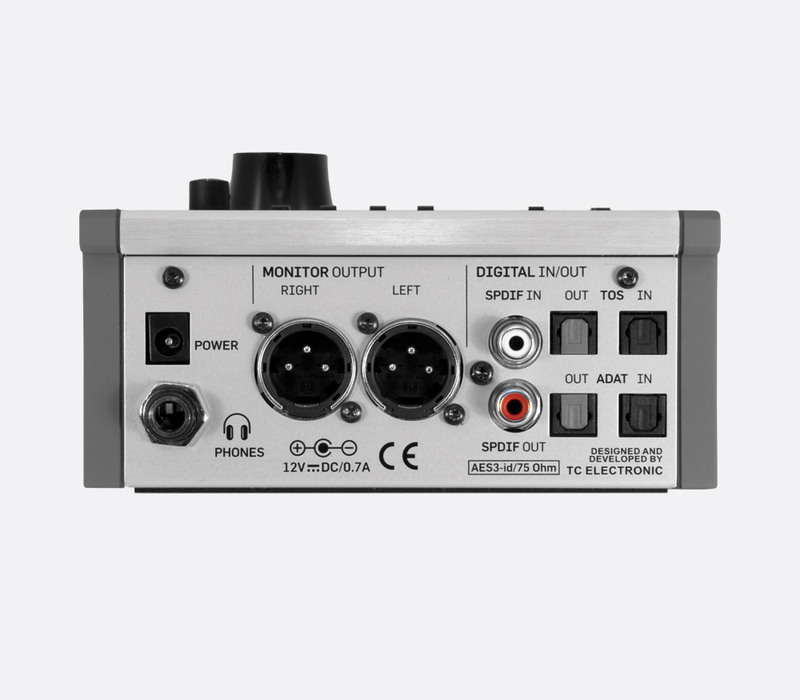 The analogue outputs use 3-pin male XLR connections. The BMC-2 digital to analogue converter (DAC) takes a digital ADAT, Toslink and/or SPDIF/AES3-id input signal and converts it to an analogue output via 24-bit conversion with a digital to analogue delay of 0.40ms at 48kHz, or 0.20ms at 96kHz. This conversion along with the JET technology jitter rejection engine results in an output with fewer clicks and dropouts. The front panel of the BMC-2 hosts all of the controllers and visual references and is split into two sections, one concerning inputs and the 'Monitor Section'. The inputs section is situated on the left side and has input select buttons (SPDIF/ADAT/TOS) that illuminate when selected. Each input has an array of LEDs to give quick visual reference to the input status when a signal is present. A selection button allows the user to switch the clock from 44.1 to 48kHz. On the right hand side, the Monitor Section has a master rotary control-wheel with LED reference point and a separate rotary headphone control to give the user independent control over the output level at the headphone stage. 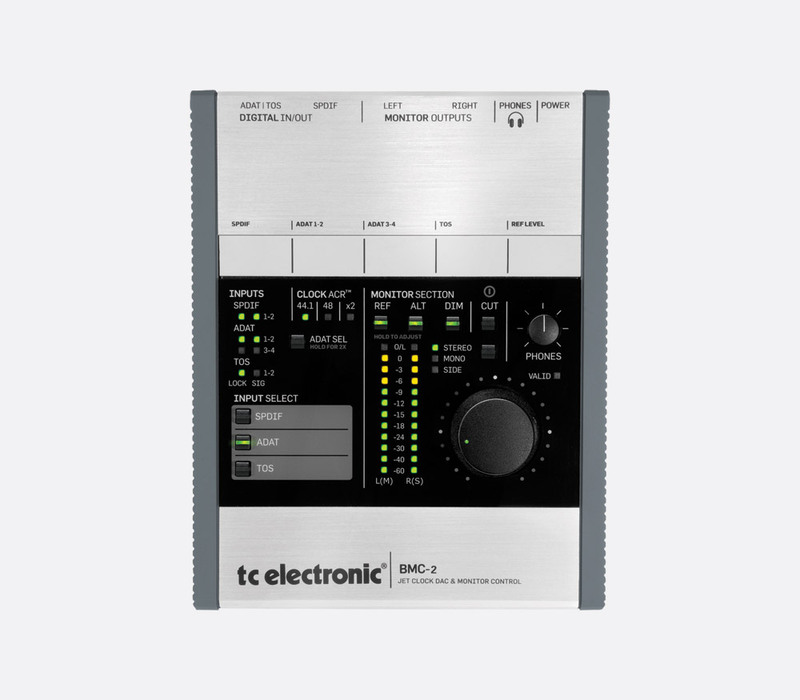 There are five selection buttons that operate various functions including 'CUT' - to mute the analogue and digital speaker outputs (not the headphone output); 'DIM' - that introduces an 18dB attenuation in the signal path; 'STEREO' / 'MONO' / 'SIDE' - to toggle the output type after the speaker gain control stage; 'ALT' - to switch between analogue and digital speaker outputs; 'REF' - to switch the output level to a calibrated listening level for optimum spectral balance. Finally, a dual 12-stage LED display (-60dB to 0dB and overload) shows the output signal level clearly. Digital inputs and outputs: RCA (phono), 75 ohms, SPDIF/AES3-id; optical, ADAT or Toslink. Analogue outputs: 2x 3-pin male XLR, balanced, less than 100 ohms; 1x stereo 6.35mm headphone jack socket, 80 ohms. Power supply: 12V DC, less than 8.4W from included AC adapter. Dimensions: 140 x 64 x 176 (w x h x d) mm. Weight: 0.82kg. Level Pilot is an analogue desktop volume control with Bourns stereo potentiometer that works in line between an audio source, such as mixing device or sound card, and reference monitors to control the audio output from 'Off' to 0dB. A single quad-core cable terminates with two (L+ R) balanced female 3-pin XLR and two (L+ R) balanced male 3-pin XLR connectors. Finished with smooth, sandblasted aluminium the Level Pilot has a rubberised 'slip free' base. No external powering is required. Dimensions: 50 x 45 (Height x Diameter) mm, top; 60 (Diameter) mm, bottom.